John’s diverse career as a creative producer, director, executive, and entrepreneur has been infused with a potent social/political consciousness. Spanning the worlds of entertainment, live events, technology, and social/political activism, he specializes in strategies and projects that use the power of storytelling and technology to encourage a healthier, more just and peaceful world. 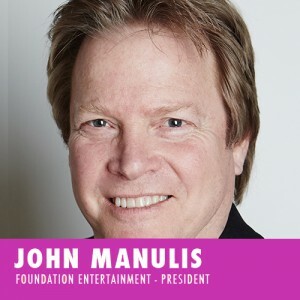 Manulis is president of Foundation Entertainment and the co-founder/CEO of ScreenSpaces, an online social publishing platform. He served as Executive Producer, Events and Lead Advance for Barack Obama’s Campaign For Change in Colorado, during the 2008 presidential campaign; consults regularly with non-profits and NGO’s on strategy, messaging/marketing and efficacy, most recently spearheading the creation and launch of Caterpillar Foundation’s innovative Together.Stronger. anti-poverty initiative for Handshake Partners; and was recognized by the Los Angeles Board of Supervisors as one of the “2012 Leaders To Watch”. Together with his wife Liz Heller, he was honored with the Founder’s Award from the nationally-acclaimed Liberty Hill Foundation. Drawn to stories that can serve as “change leaders” for our society, Manulis’ career as a creator and producer includes serving as an executive producer of “American Idol”‘s historic, groundbreaking and Emmy-winning charity event – “Idol Gives Back”, and producing or executive producing productions including THE BASKETBALL DIARIES, ARCTIC TALE, TORTILLA SOUP, double-Independent Spirit Award nominee CHARLOTTE SOMETIMES, THE L.A. RIOT SPECTACULAR, SWING KIDS, FOXFIRE, BELIEVE IN ME, HBO’s DAYBREAK and BLIND SIDE, CBS’s acclaimed series “Comedy Zone” and 38-share MOW “Intimate Strangers”, and the off-Broadway sensation “The Umbilical Brothers’ THWAK”. As co-founder and CEO of Visionbox Media Group, Manulis helped pioneer the use of digital technology for the production and distribution of motion pictures, spearheading a company that co-produced and/or post-produced such noted films as THE COOLER, THE ILLUSIONIST, PAINTED VEIL, THE MATADOR, DUMA and AURORA BOREALIS. As Head of Filmed Entertainment for Samuel Goldwyn Films, Manulis supervised the production, or acquisition, of films including THE MADNESS OF KING GEORGE, THE PREACHER’S WIFE, ANGELS AND INSECTS, I SHOT ANDY WARHOL, WELCOME TO WOOP WOOP, BENT, THE KING OF MASKS and BIG NIGHT. Manulis serves on the board of directors of the Liberty Hill Foundation and the Mayor of Los Angeles’ Getty House Foundation, and is a member of the Academy of Motion Picture Arts and Sciences, the Writers Guild of America, East, and the Producers Guild of America. Mr. Manulis began his career casting and directing theater off­–­Broadway. He received an A.B. degree from Harvard University.